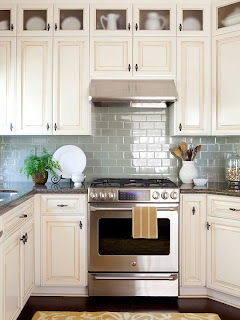 Stretch your kitchen budget and put these creative, money-saving ideas to work for updates such as revamped cabinets, a fresh backsplash, and more! A colorful or patterned rug instantly gives your kitchen a boost of personality and comfort. 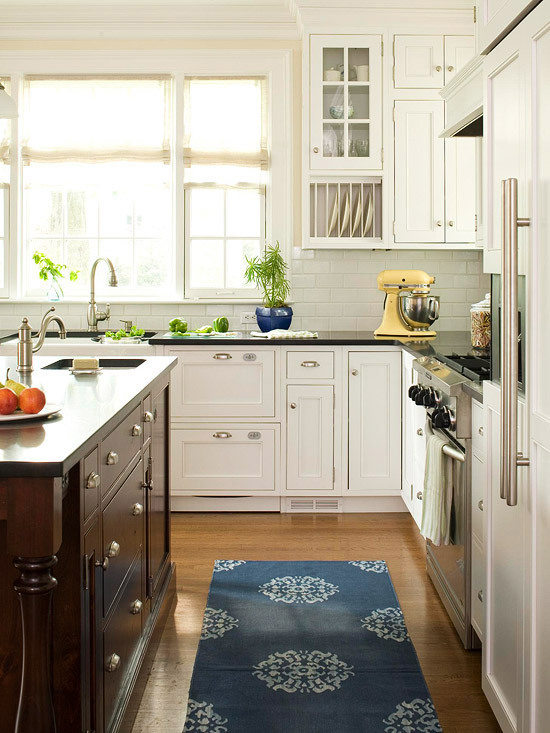 Plus, a comfy rug adds warmth underfoot and a touch of homeyness to your hardworking kitchen space. Consider placing a rug in areas of the kitchen such as in front of the range, refrigerator, or sink, where you tend to do a lot of standing. Be sure to place a slip-prevention mat beneath the rug for safety. 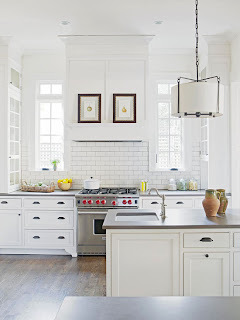 The quickest way to rev up your kitchen's style quotient is to roll on a fresh coat of paint. 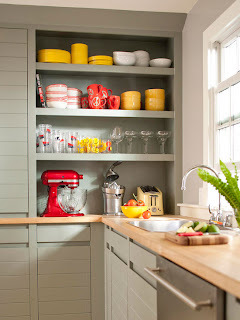 With so many color choices available in wipe-clean paints, drab cabinets or walls can be banished in a weekend. 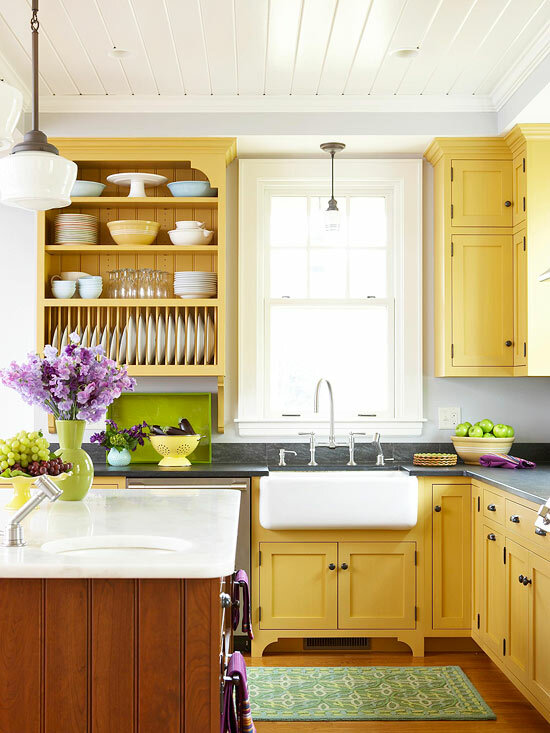 A burst of cheery yellow cabinetry, tempered by a rich wooden island and floors and a white beaded-board ceiling, cozies up this room. Updating your kitchen's style might be as simple as looking overhead. Consider switching out an old light over an island for a more personalized look. With so many styles and finishes available, finding unique lighting to suit your kitchen's style is easier than ever. For lighting that will hang above a work space such as an island, search for a model that balances style and function and provides adequate lighting for cooking tasks. 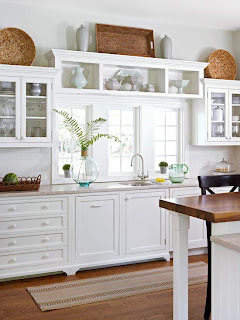 To give your kitchen a major style update, forgo ordinary kitchen cabinets and incorporate open shelving. 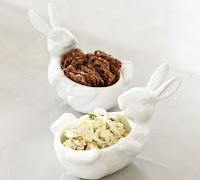 Open storage offers display space for pretty dishes and transforms even the most ordinary pieces into works of art. If totally exposed cabinetry sounds a bit daunting, consider replacing some of your cabinet fronts with frosted glass. The result will look modern and fresh while slightly obscuring the cabinet's contents. A kitchen with windows offers an opportunity to incorporate storage in unexpected ways. 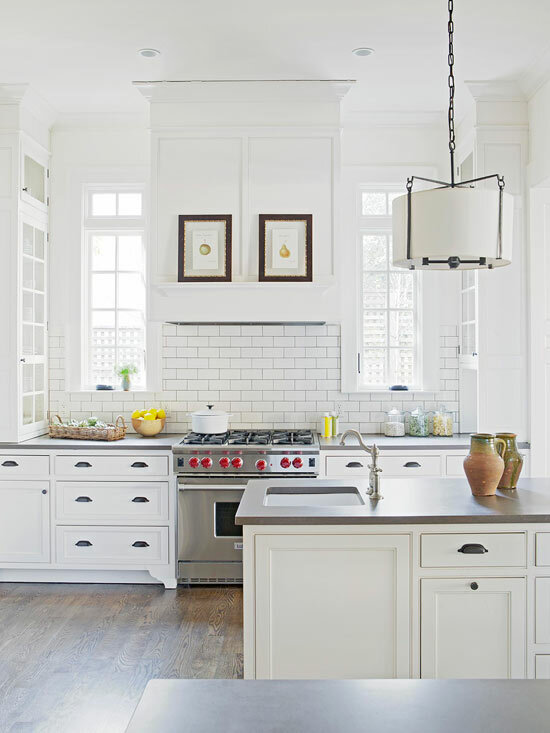 In this kitchen, a bank of sturdy shelves has been installed directly over the window trim and painted the same crisp white as the trim and surrounding cabinetry. The fixed shelving adds display space for decorative dishware and draws attention to the stunning bank of windows. 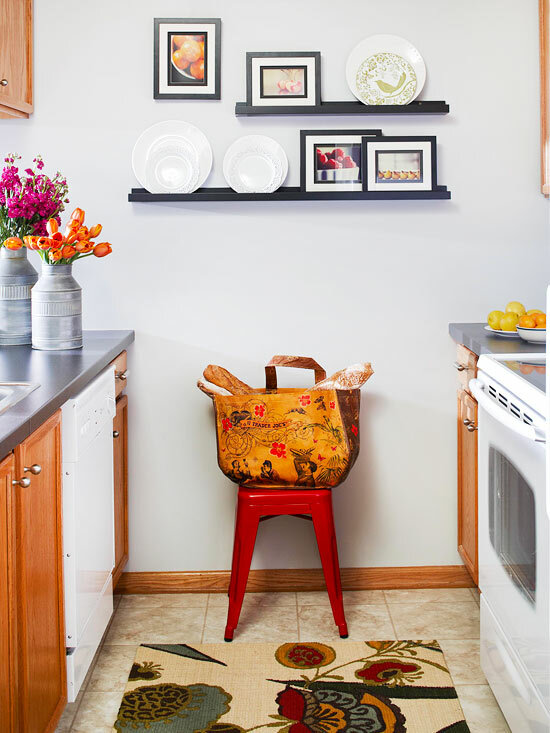 Lift your kitchen's appearance with cheery wall art. Although kitchens are often considered mere work spaces, giving your kitchen a boost of style will transform it into a cozy gathering space. Hang playful prints on walls, or place them on floating shelves and countertops to spruce up your space and give it a dose of character. 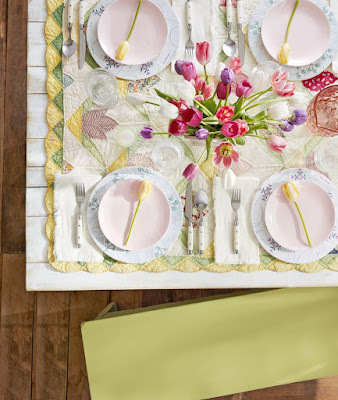 Save your favorite decorative dishware from a life of collecting dust by looking overhead. 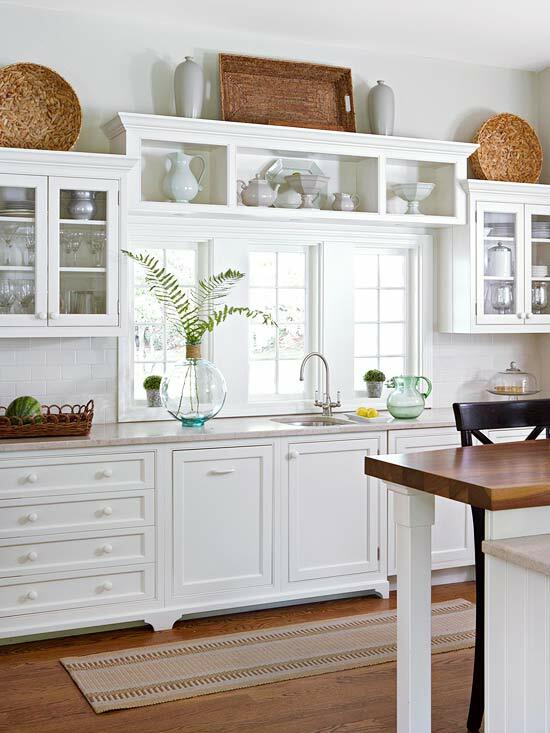 A row of small clear- or frosted-glass-front cabinets above concealed cabinetry is perfect for displaying little-used dishes such as pitchers and oversize serving bowls. 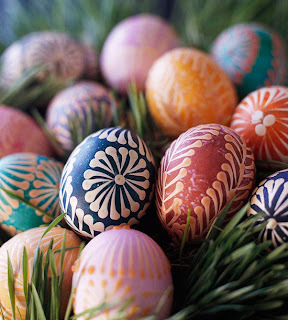 To create a cohesive look, make sure all of the dishes are relatively the same color and scale. 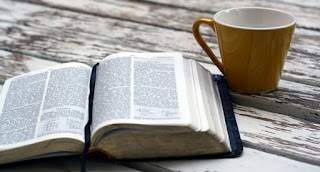 Improve the functionality of your kitchen -- without spending a lot -- by transforming an old furniture piece into a work space. Any table or chest can be enlisted as an island stand-in, provided it can be adjusted to the right height. 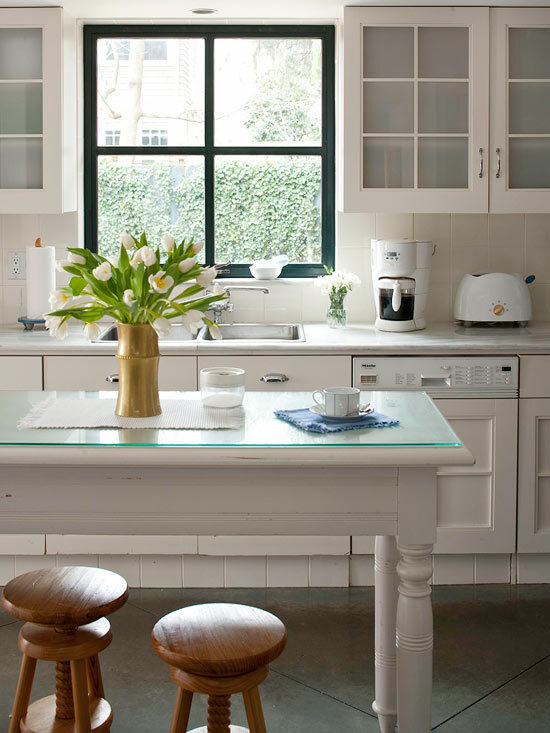 This narrow table, painted white and outfitted with a beveled-glass topper, now serves as a delightful dining area in this tiny kitchen. 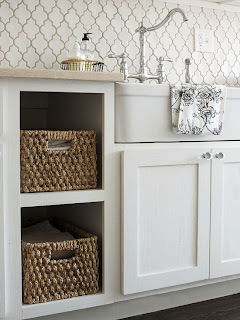 Break up a wall of concealed cabinetry by removing the doors and adding pretty storage baskets. To create drawerlike convenience, purchase hardware that will accommodate slide-out baskets. 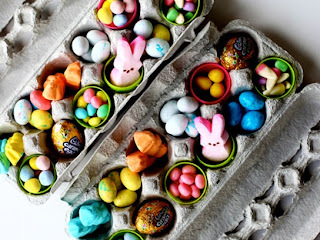 Use the baskets to store items from shelf-stable vegetables to kitchen linens.